Jul 23 Could we produce a public relations book in three hours? Here’s an inspiring project by students at Boston University’s College of Communication under the direction of tutor Professor Edward Boches that I spotted on David Meerman Scott’s blog. The team of 24 students conceived, wrote and designed a book in three hours. The book called Get out of your mini-van and into our spaceship is published on Slideshare. It shares insight from the upcoming generation of marketing practitioners with their future employers. The result is a fantastic piece of work. 14-short essays accompanied by sharp images explore the attitudes of the students to their future profession. 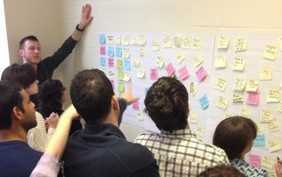 The project kicked off with a blank wall and a stack of sticky notes. Content ideas were crowdsourced and curated into a sequence for the book. The group was then divided into teams of two to develop content. One person was focused on words and one on images. Technology such as DropBox and Google Documents were used to foster collaboration and manage the workflow. As copy was completed, the students turned their hand to the editing and production process. The workflow is very similar to that used by the CIPR Social Media Panel to create Share This and the upcoming edition Share This Too. Where it differs is the raw speed and digital self-publishing. Professor Boches deserves plaudits for his approach to teaching. This exercise will have taught students more about the future of their profession than hours of lectures. The students have used the very processes and workflow that the marketing industry is shifting towards and produced an excellent piece of work in the process. I’d love to repeat the project with students and practitioners for the public relations profession. What do think? Leave a comment if you’re up for the challenge.